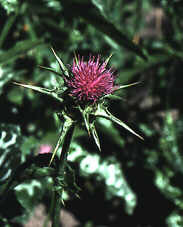 The milk thistle contains substances that protect the liver. The milk thistle, Silybum marianum, is native to the Mediterranean and the Orient and has long been used in medicine. Dioscorides in Ancient Rome recommended the plant for use against various illnesses. The fruits have been used against stitch, as well as problems of the spleen and liver. Research has shown that the medically interesting substances in the fruits of the milk thistle are of a type known as flavonolignans. Originally it was believed that there was one substance, silymarin. However modern research shows that silymarin consists of several closely related substances. Several of these can protect the liver. The fruits contain 1.5-3% silymarin. According to the authorities within medicinal plant research, the flavonolignans from the milk thistle are the most studied natural products for protection against liver damage. Since 1969 more than 100 scientific articles have been written about their pharmacology and clinical use. One example from a two year clinical study showed that treatment with silymarin reduced deaths in patients with severe liver damage. Half of the patients were treated with silymarin three times a day and the other half were given placebos – sugar pills. After two years, the proportion of survivors in the placebo group was 53% and in the silymarin group 76%. Silymarin is also used in the treatment of poisoning by destroying angel or death cap (Amanita phalloides and Amanita virosa) amanita mushrooms. It has also been claimed that silymarin has an effect on stomach ulcers and this has been confirmed in tests on sores produced in the mucous membrane of the stomach.